New York’s Bloomberg Sports and Texas sports technology company, MVPindex today declared a new partnership combining the world’s leaders in sports analytic technology together with the richest global social media statistics. This sports tech business arrangement will deliver a new fashion for analyzing an overall athletic performance measurement via proprietary, science backed software solutions. The Sports Techie community blog has documented the rise of performance analytics in the sports industry and are honored to review this breaking news story. The new partnership targets engagement for brands, consumers and media companies around sports-related assets that can be sponsored such as teams, leagues, athletes and venues. Their new sports tech products will be designed to enhance and quantify such business opportunities for proactive clients. BSports, the world’s leaders in sports analytic technology and the newest member of the STATS global network, and MVP Index in Dallas, professional sports industry’s first index measuring athletes, teams and leagues social media brand value calculated in real-time, are together focused on a combined effort that will create comprehensive and robust tools created for precise measurement of the overall athlete impact on and off the field. Beginning with a joint study of the impact a football player’s social media index and his fantasy football draft projection round, they plan to unveil several case studies that indicate how fans are best avoiding influence by “trending” social media entities whose fantasy sport projections do not measure the same way. 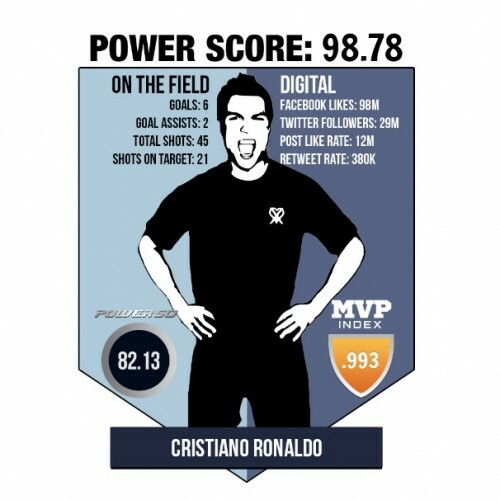 Further ground-breaking analysis is being conducted on BSports Power 50 European soccer player’s such as Christiano Ronaldo on Real Madrid, and the level of degree their performance metrics accurately reflects upon their social media data. The two pioneering sports tech companies plan to leverage across all sports in the near future, the sophisticated MVPIndex social media scores together with the complex BSports performance and predictive analytics. 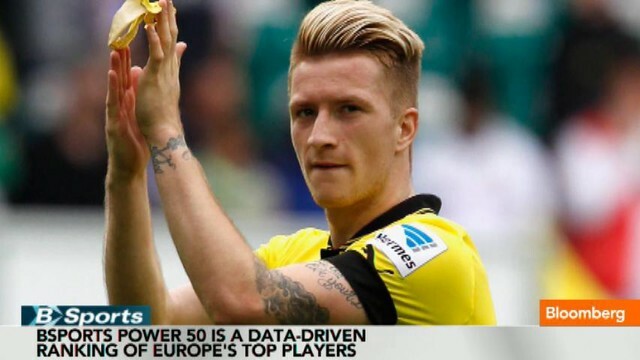 Launched in 2010, Bloomberg Sports (BSports) takes the technology developed by Bloomberg, the leading global provider in data and analytics, and applies it to the vast data analysis opportunities in sports. BSports delivers services for teams, broadcasters and athletes and boasts a consumer tool for European football, “Match Analysis,” a powerful predictive and analytic tool forecasting game results and scores to help bettors. BSports has also developed pre and post-game commentary packs along with on-air graphics for broadcasters including Sky Sports, Channel 4, Turner and Fox in a number of sports. Bloomberg Sports was named by SportsPro (2014) as one of “50 Companies Shaping World Sport”, by Fast Company (2013/14) as Finalist for the “Most Innovative Technology Companies in Sport”, and by Mashable as one of the “Five Most Innovative Sports Brands for 2012”. For more information go to bsports.com. New York’s Bloomberg Sports, and Texas sports technology company, MVPindex today declared a new partnership combining the world’s leaders in sports analytic technology together with the nation’s richest social media statistics. MVPindex is the professional sports industry’s first social media intelligence platform that measures the social media brand value of athletes, teams and leagues in real-time. MVPindex provides brands, teams, and leagues with data and analysis of the best performing content, competitive analyses, and the knowledge and best practices they need to create more impactful campaigns in the future. In addition, the company looks at the real time social and digital footprint of more than 20,000 athletes, and compares those footprints across sports. Users of MVPindex data include top brands such as Under Armour and SuperStroke Golf, agencies such as Lagardere Unlimited, and sports teams such as the Kansas City Chiefs and Ganassi Racing. STATS is the world’s leading sports technology, data and content company. The company passionately abides by a mission to revolutionize the way sports contests are viewed, understood, played and enjoyed. STATS’ calling card consists of real-time scores, historical sports information, Associated Press editorial content, a turnkey fantasy sports operation and SportVU technology. STATS’ worldwide client network of media companies and professional sports leagues and teams utilize a broad spectrum of dynamic in-game broadcast presentations and virtual images, multimedia enhancements and game analysis, and tactical coaching tools. STATS is owned by Vista Equity Partners. For a complete tour of STATS’ sports content portfolio and solutions, visit www.stats.com. STATS is the world’s leading sports technology, data and content company. Sports Techie, The day and age when a superstar’s Power Score number calculated by their Facebook likes and post like rate, together with their Twitter followers and retweet rate, added to their Instagram metrics, all combined with key game statistics such as touchdowns, goals and shots; is absolutely here thanks to the combined vision and execution of BSports and MVPindex sports tech solutions. BSports parent company, STATS will reap the benefits of these never before seen analytics as will fantasy sports fans and sponsors alike. Look for this multi-faceted analytic evaluation partnership data to soon be a significant component of the STATS Solutions Groups portfolio listed below. ICE – ICE is an interactive technology tool used to access, manage and utilize critical analytical information throughout professional and collegiate organizations – from the GM to the player. ICE Lite – The ICE Lite application is a team and player analysis tool that enables in-depth player and team analysis. Fan Experience – Compelling sports experiences for fans, both in-venue and at home. STATS PASS – 24/7 online statistics, scouting reports and historical research tool. Sports Social Intelligence has taken on a new importance for players, fans and teams, as well as fantasy sports leagues and owners. To be able to monitor and track a brand’s best performing campaigns, as well as competitors marketing efforts using Big Data will ensure more tailored and successful programs in the future. Endorsements can make or break a company’s branding strategy so selecting the right athlete or team is as easy as using MVPindex and BSports brand new sports analytics evaluation performance tools across a number of traditional and new age sports. Social media is not going away and neither are performance sports analytics. Combined, they will only become a more stable asset to rely on when considering any sportsbiz decision to be made, whether you are a general manager in the front office, at home managing your fantasy sports teams via your customized mancave, or on the road using mobile devices to stay connected to this must-have Sports Social Intelligence data.